The international break allows Fantasy coaches all over the globe some time to assess their teams and tinker where necessary, and the performances of some stars on Matchday 6 will certainly have provided food for thought. 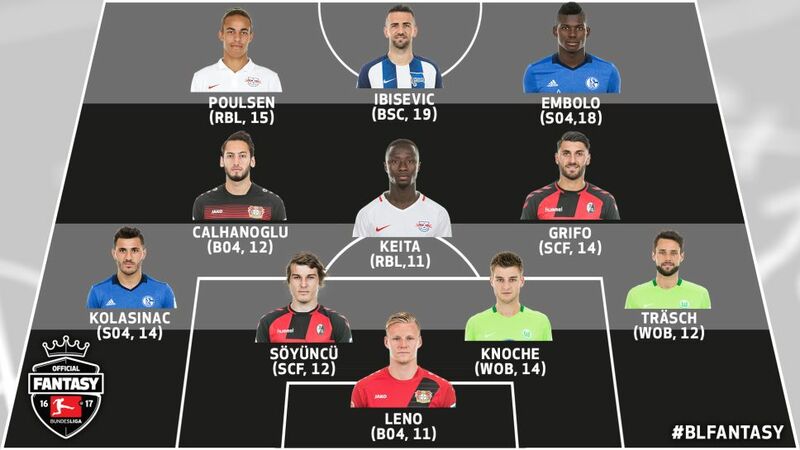 As ever, we have compiled the Team of the Week so you can look at who set the Bundesliga alight on Matchday 6. Bernd Leno (Bayer 04 Leverkusen, 11 points) – Faced with the attacking might of Borussia Dortmund, you can expect a lot of shots on your goal, but Bernd Leno dealt with everything the Westphalians could throw at him, keeping an admirable clean sheet which included several key stops among the four he had to make. Christian Träsch (VfL Wolfsburg, 12) – There was simply no getting past Träsch for the 1. FSV Mainz 05 wingers with the German full-back winning duel after duel to boost his points' tally, with a clean sheet and a couple of shots thrown in for good measure. Robin Knoche (VfL Wolfsburg, 14) – At the heart of the Wolfsburg defence, he won even more tackles (16 – the most of his team) as the Wolves kept their third clean sheet of the campaign. Caglar Söyüncü (SC Freiburg, 12) – The 20-year-old Freiburg defender won an outstanding 92 per cent of his duels in another mature, solid performance. Sead Kolasinac (FC Schalke 04, 14) – The assist for Schalke's second goal boosted his points, but he also won 14 challenges to help ensure a clean sheet. Naby Keita (RB Leipzig, 11) – Another 90-minute showing from Leipzig's Keita with 18 duels won in midfield making him stand out from the crowd, while his two shots showed another dimension to his game. Vincenzo Grifo (SC Freiburg, 14) – After four years without a goal for Hoffenheim, Italian midfielder Grifo opened his Bundesliga account for Freiburg. He was involved in six of his side's 11 shots, taking two and setting up a further four. Hakan Calhanoglu (Bayer 04 Leverkusen, 12) – Had a hand in seven of his side's 11 shots on goal and provided the assist for both of his team's goals against Dortmund. He also won 14 of his 25 challenges. Yussuf Poulsen (RB Leipzig, 15) – He had two shots, and one of them registered his first Bundesliga goal. The hard-working forward also contributed to his side's win over Augsburg with 16 tackles won. Vedad Ibisevic (Hertha Berlin, 19) – With 97 goals, Ibisevic is the most prolific player from Bosnia & Herzegovina ever to grace the Bundesliga stage, and two of those – his 20th Bundesliga brace – came against Hamburg. All said, he sent in four shots on the Hamburg goal. Breel Embolo (FC Schalke 04, 18) – His first brace was also his first two Bundesliga goals, and he netted them with sublime efficiency: from his only two shots of the game. For more news and features, head to our dedicated Games channel.